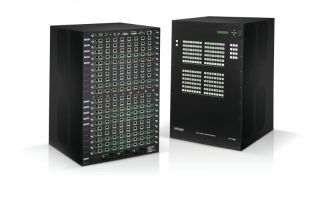 Lightware Visual Engineering has furthered its support of HDBaseT with its HDBaseT-enabled 65x65 and 80x80 modular matrix switchers and the new UMX-TPS product family, featuring HDBaseT extenders. Live working demos of the entire product line will be shown in the Lightware booth at InfoComm 2014 at the Las Vegas Convention Center, June 14-20. “HDBaseT is playing an important role in the capabilities of Lightware’s growing product range,” says Drew Taylor, director of sales and applications at Lightware U.S.A., the US distributor for Budapest-based Lightware Visual Engineering products. HDBaseT’s 5Play feature set, which delivers uncompressed full HD digital video, audio, 100BaseT Ethernet, power and control signals over a single CAT5e/6 cable, can be used for commercial integration.